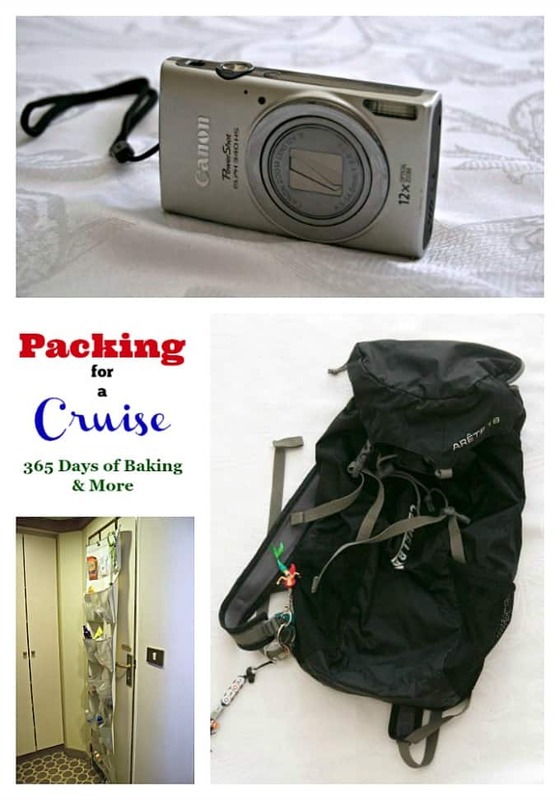 Are you packing for a cruise? In this post, you’ll find the essentials you’ll need along with other items to help make your cruise experience a great one! This post also contains affiliate links and I thank you for your support. This past March and into April, I had the incredible opportunity to sail with Princess Cruises for a 10-day Panama Canal Cruise. Over the course of the next 5 days, I’ll be sharing my experience with you. You won’t want to miss it! I was able to spend 10 days with other bloggers seeing parts of the world that were completely new to some, if not all of us. We’re writing posts about our trip and I’ll be sharing them over the next few days as well. You’ll want to read Facing Fears Through Travel – Diving Into Aruba from Valerie and Valise. She talks about how she overcame her fear of deep water and went snorkeling at a ship wreck! Brenda from A Farm Girl Dabbles shares her Travel Tips for Your Panama Canal Cruise. She has some really good tips about pre-planning you’ll want to remember. Concerned about gaining weight during your trip? Read Staying Fit on Vacation (Health and Fitness Tips for Cruising) from Lemons for Lulu. I found it very helpful to start a packing list about a month or so before we were leaving and added to it as I thought of things. This way, I was sure to have everything I needed and crossed it off as I put it into my suitcases. At the top, put your passport! As you probably know, there are always the essentials you need to bring whenever you go on a trip – clothes, shoes, toiletries, camera, etc. 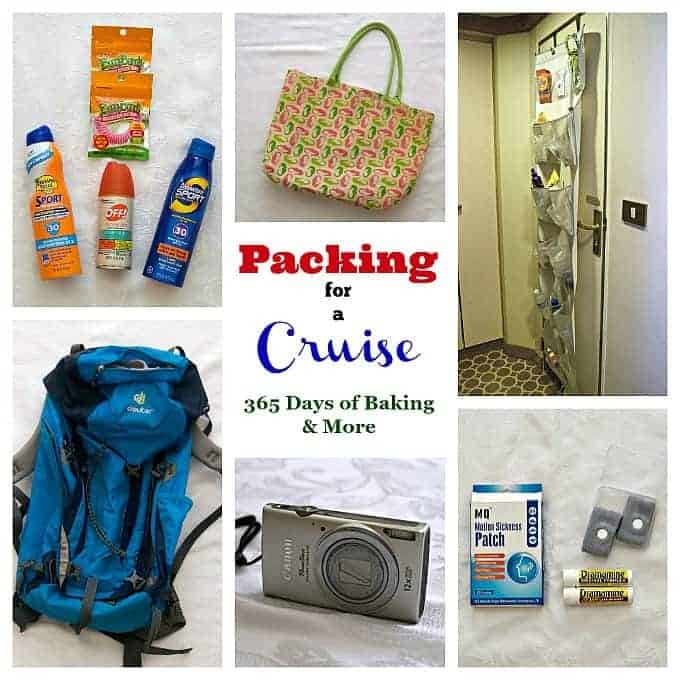 When you go on a cruise, you still need to bring those items, but I’ve also found that there are a few things that I can’t go without. Having everything you need on hand is essential to having a great trip. Yet, don’t worry if you should forget a few of the smaller items, you’ll most likely be able to find them in the stores aboard the ship. My tip: Keep your carry-on with you for boarding and disembarking. You’ll be separated from your large luggage upon arriving at port and there is no telling as to when it will arrive at your cabin. Therefore, it’s best to have your carry-on containing the clothes you’ll need for the first day and night along with essential toiletries, medications and makeup. And remember to put one bathing suit in there so you can hit the pool! When you disembark, Princess Cruises gives its’ passengers the option of having your luggage checked the night before. This way you can easily disembark without having to cart large and cumbersome suitcases around through crowds of people. Believe me, it’s SO much easier this way! Your carry-on comes in handy the last night as well. You’ll have that smaller bag, so you won’t have to pack up the clothes or shoes you might want to wear the last night and the toiletries you’ll need in the morning. 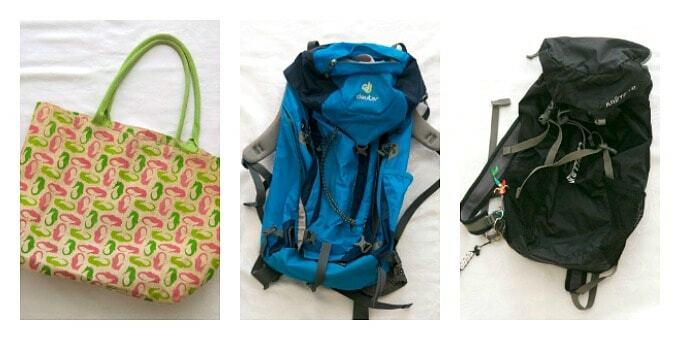 The large blue one pictured in the center is one my daughter used as her carry-on. A larger backpack like this is great when you have excursions to beaches that you’ll have to bring towels to. It has lots of pockets to separate phones and hold passports, so you won’t have to go digging for them when needed. The smaller black one similar to the one I’ve linked to is handy for day excursions when you don’t need too much, but still need to bring your phone, camera, wallet and identification. It carried our water bottles and didn’t take up much space in Alex’s large suitcase. The bag on the left with the seahorses is just a waterproof beach bag that was easy to pack in the luggage. It was perfect when we went to the pool, carrying water bottles, sunscreen, phones and books. Also, bring some plastic bags, both sandwich and freezer size. They can be sealed protecting your phone, passport and small camera in case of rain or a watery excursion. Though the rooms may be smaller than what you’re used to living in on land, they are comfortable, not at all claustrophobic and have adequate storage space. Suitcases will fit under beds. Drawers will comfortably keep your clothes, cameras, books, and other items. The closet is plenty big enough for clothes for two people with shoes on the floor. My tip: Pack some of your own hangers. While there is an ample amount provided, it never hurts to have more, especially if your taking a longer cruise. Wire hangers will take up less space in your luggage, but I prefer the plastic ones. You’ll want two bathing suits. That way you won’t have to worry about putting a wet, cold one on. Not fun. Bring a rain jacket and small umbrella – after all, when you cruise the Panama Canal you are in the RAIN forest. We never got soaked as we thought we might, just a bit wet. Everyone’s experience is different, of course so you’ll want to be prepared. There are usually two formal nights. It’s fun to dress up and have your picture taken, so bring your cocktail dress, Sunday best, and tuxedo. Princess Cruises also offers Formal Wear Rentals. You’ll just want to make sure you make those arrangements prior to embarking. Shoes! It’s important that you bring the appropriate shoes – dress shoes for formal nights, a casual pair, a good pair of walking shoes (sneakers) for excursions, and some flip flops for going to the pool. In the top picture, we brought Dramamine, Motion Sickness Patches, and the Sea Band Adult Wrist Bands. I grew up on boats, so have never had an problem with sea sickness. My daughter, on the other hand feel nauseous with just riding in the car on occasion. I attribute it to going on a roller coaster not knowing I was pregnant at the time. I wanted to be prepared with everything and surprisingly, she really didn’t need the majority of it, just some Dramamine. You’ll want to make sure you bring any medications you’re taking along with the standard stuff. Hand sanitizer (even though it’s required before entering any dining facilities) is good to have along with Emergen-C, Advil, Excedrin, etc. Also, pack that Midol and necessary female essentials if you might have a visitor during your trip. Ear plugs will be helpful if your roommate snores or if you find your cabin located near or above a nightclub, busy hallway or heavy door. Sunscreen, PLENTY of sunscreen! Bring a couple of bottles because you’ll use it at the pool and pack it in your backpack for excursions. We thought when we were zip lining in Costa Rica that we would be bothered by bugs. Not so, believe it or not! Yet it’s good to have it just in case. I also brought these Buggy Wrist Bands which we didn’t even use, but I was glad I had. Small packets of laundry detergent. The Coral Princess does have paid laundry facilities on board if you need to wash your clothes. One item that I find absolutely essential is this over the door shoe rack with large pockets. 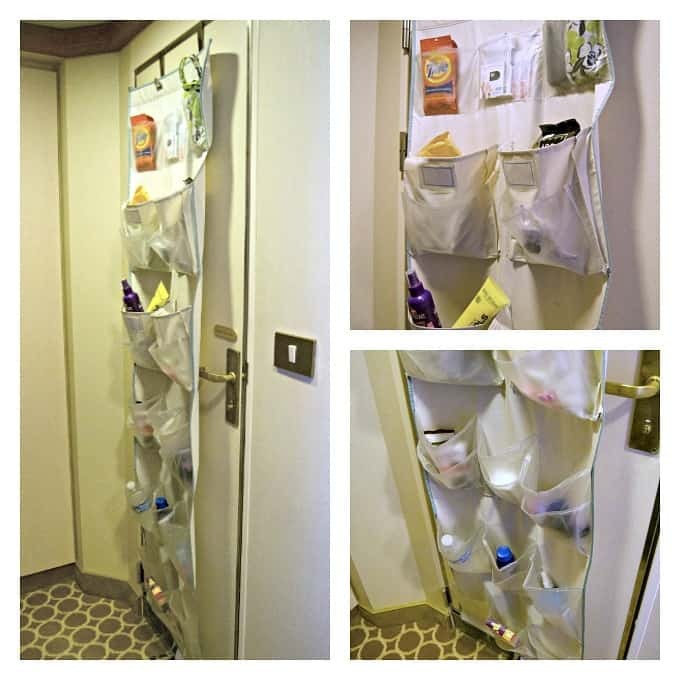 While there is a lot of storage on board, It’s nice to keep a lot of our toiletries in these pockets, so that the bathroom counter isn’t cluttered. Also, the sunscreens are handy to grab along with the umbrella, water bottles, etc. It goes without saying if you’re bringing your phone, you should bring your charger, too! Yet if it’s not on my list I’ll tend to forget it. Make sure you contact your cellular company to let them know you’ll be traveling and arrange any international cell service, too. Ooh, a portable charger came in handy for those excursions that were on the longer side. Last thing I wanted was to have a dead battery on my phone in a foreign country. 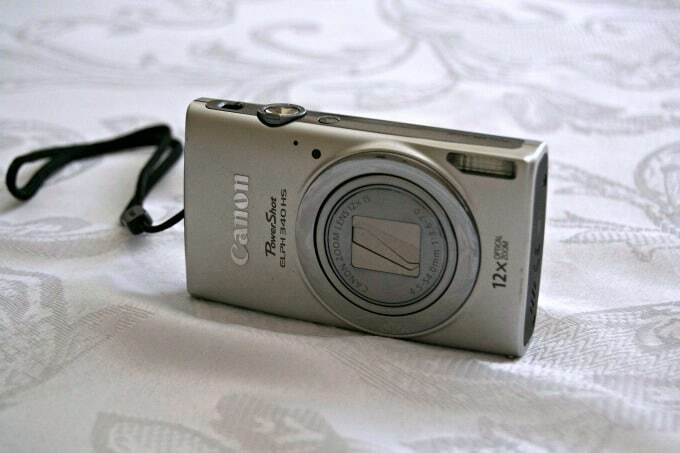 Some people bring their expensive cameras with different lenses, but between my phone and this small powershot camera, I was covered for picture taking . Also, bring an extra SD card(s), extra battery and of course, that battery charger. Finally, a power strip, pack a power strip! Yes, there are outlets in your cabin, but if you have multiple cell phones, chargers, computers, curling irons, straighteners, you’ll need those extra ways to access electricity. If you’ll be traveling, especially internationally, be sure to let your bank and credit card companies know at least a few weeks in advance that you’ll be traveling so they don’t freeze your accounts for suspicious activity. Bring cash in the form of small bills. This is especially useful for giving tips to tour guides and drivers on excursions. They greatly appreciate the money and it is a large part of their income. Of course, if you really like one of your tour guides you can give them more! These were the items I thought were most important to have while on our cruise. If you’ve been on a cruise, I’d love to hear what items you find you can’t do without. Let me know by leaving a comment! If you’ve booked a cruise, I’d also love to hear when you’re going! Kim, I hope you have a great time on your next cruise – it sounds fantastic! I love your tips. Thanks so much for sharing them with us. Money for tips was one thing I’d forgotten, so I have to add that as we found it important as well! My daughter and I also used magnets which I’ll be sharing in another post. This is such good info!